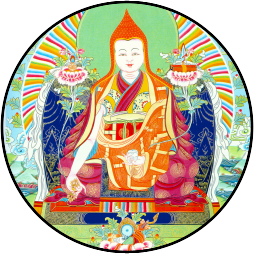 Jamyang Khyentse Wangpo is the body incarnation of Jigme Lingpa. All of the lineages of Tibetan Buddhism flowed into this great master. A proponent of Rime, or non-sectarianism, he propagated Nyingma, Kagyu, Sakya, and other teaching lineages. "There is no more progress [in the realization of the nature of the mind] than I realized then." His Dharma activity was vast. He built temples, libraries, and inspired thousands of people to take up the practice of the Dharma. He taught extensively to disciples of many traditions and gave instruction on the Longchen Nyingthig nearly twenty times.